Don't look back - you might have just stepped in something. 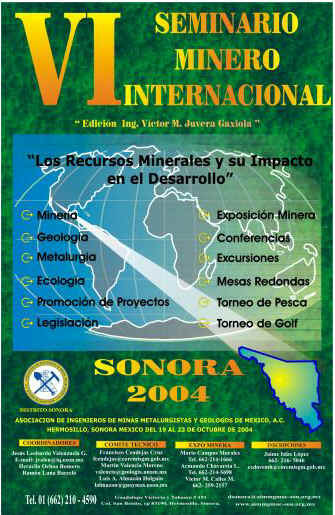 Districto Chihuahua of the Asociacion de Ingenieros de Minas Metalurgisticas y Geologos de Mexico, A.C. is organizing this event. Event will be at the Hotel Westin Soberano www.westinsoberano.com. This event is held every 2 years, the last meeting being in October, 2002. The focus will again be on Mining, Society and the Environment. The main objective is to show recent developments in exploration in Northern Mexico, and provide an arena where investment in mining ventures can be negotiated. Several post-conference tours are being organized for May 1st. One to Grupo Mexico´s Santa Barbara silver mine near Parral, and a second tour to Glamis Gold's El Sauzal Mine and the third is to the Ocampo District, currently being prepared for production by Bolnesi & further explored by Gammon Lake Resources.